During the week of February 6th, immigration agents arrested a reported 600 people across the United States, at least 40 of them in the New York City area alone. According to Immigration and Customs Enforcement (ICE), officials are arresting very specific targets as opposed to spontaneously checking employees’ papers at various businesses. Although ICE claimed that some of these individuals were previously convicted of violent crimes, the details surrounding the roundup have still not been released. In spite of these recent activities, Mayor de Blasio made efforts to reassure New York citizens that city officials with the New York Police Department would not be asking about individuals’ immigration status, nor would they take on the activities of immigration enforcement agents. New York has been deemed as a sanctuary city, meaning that it has declared that it will not be complying with requests made by immigration authorities to hold illegal immigrants who have committed low-level crimes. According to the Central American Refugee Center on Long Island, New York hasn’t had any sweeps or checkpoints as of now, but rather, immigration officials are conducting their roundups in private homes. While criminal defense attorneys defend individuals who are accused of crimes and immigration attorneys assist people with immigration issues, a violation of U.S. immigration law can result in deportation, and a violation of laws related to immigration can result in an individual serving jail time. For example, if you are convicted of an immigration crime and you are not a U.S. citizen, you can go to jail and then be deported after serving your sentence. Thus, a criminal defense attorney can assist you with avoiding the conviction for the crime or even minimizing the amount of jail time you serve if you are convicted. Passport or visa fraud: using false information to apply for a U.S. passport. This includes U.S. companies that apply for work visas on behalf of workers and then violate U.S. law, such as paying them less, or that hire undocumented workers. 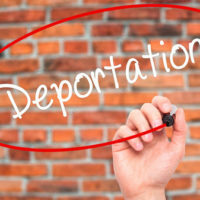 If you or a loved one is facing deportation as the result of a conviction for a crime, or has been unjustly accused of a crime in an effort to be deported, etc., our criminal defense attorneys can help. Contact us at the office of Phillip J. Murphy today for a free consultation in Bergen County.